Using simple mathematical formulas, most as basic as Pythagoras's theorem and requiring only a very limited knowledge of mathematics, Professor Huntley explores the fascinating relationship between geometry and aesthetics. Poetry, patterns like Pascal's triangle, philosophy, psychology, music, and dozens of simple mathematical figures are enlisted to show that the "divine proportion" or "golden ratio" is a feature of geometry and analysis which awakes answering echoes in the human psyche. 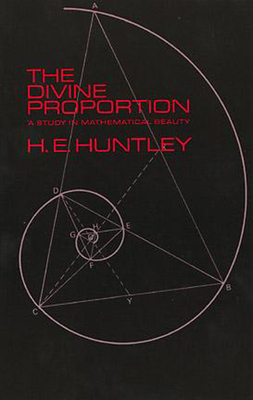 When we judge a work of art aesthetically satisfying, according to his formulation, we are making it conform to a pattern whose outline is laid down in simple geometrical figures; and it is the analysis of these figures which forms the core of Professor Huntley's book. For the philosopher, scientist, poet, art historian, music listener, artist, as well as the general reader who wants to understand more about the fascinating properties of numbers, this is a beautifully written, exciting account of the search for a naturally manifested aesthetic that has occupied man since he first asked the question "why?" "This is a delightful book to read. . . . It wanders here and there through some of the most attractive byways of simple mathematics, returning always to the oddities and pleasures of the golden section. This is a browser's book -- a happy, untidy traveling or bedside book for those who know how to enjoy the charm of numbers and shapes." -- Dr. J. Bronowski, The Salk Institute.